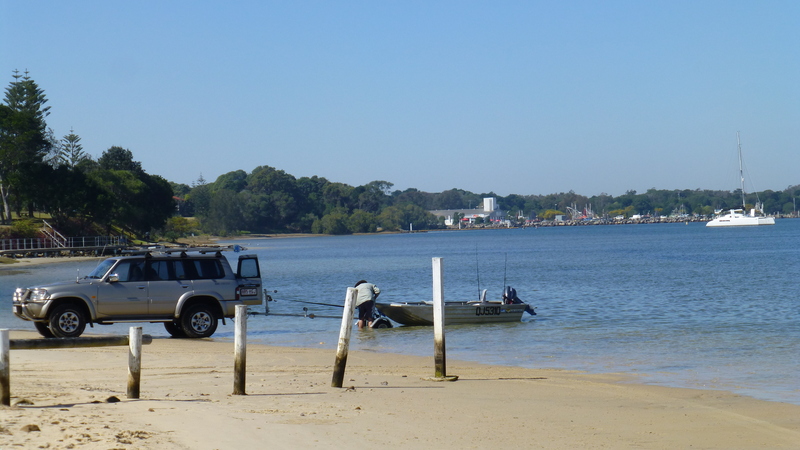 The small seaside village of Iluka is a very quiet, relaxing place on the north side of the mouth of the Clarence River in Northern NSW. It’s a place far away from the hurly burly of the daily life of cities and towns. 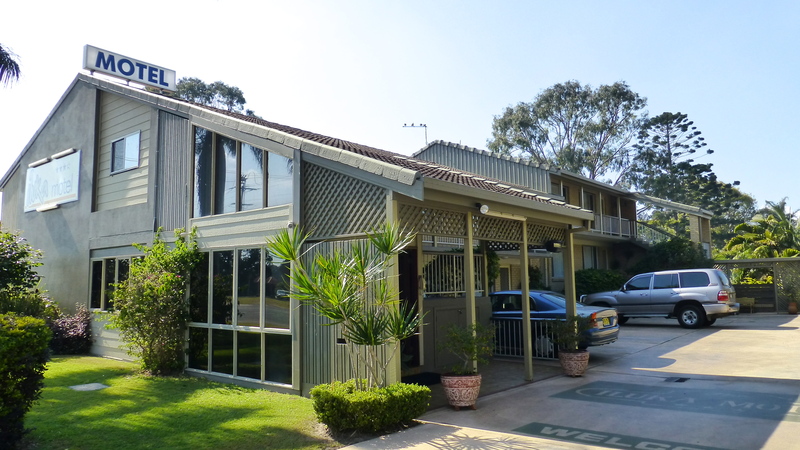 As a holiday destination, Iluka’s neighbour across the river, Yamba, is a much bigger and livelier place. But I wanted a quiet place to recharge my batteries, to slow down and enjoy the gentle things in life. I found that place in Iluka. So why not come with me for a quiet stroll along the riverside. 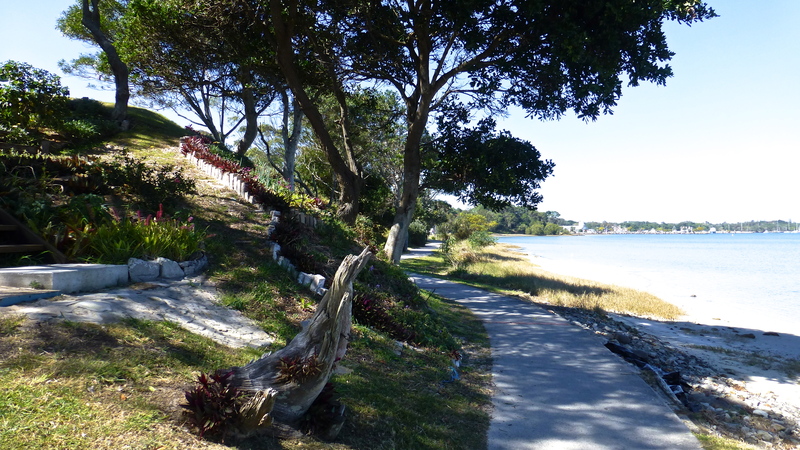 This walk will take us along the edge of Iluka Bay, a man made safe harbour and refuge on the edge of the river. This was the first view from the path I followed down to the river. There to greet me were two of those well known and much loved birds of the waterways, the Australian Pelican, Pelecanus conspicuillatus, a very conspicuous bird. 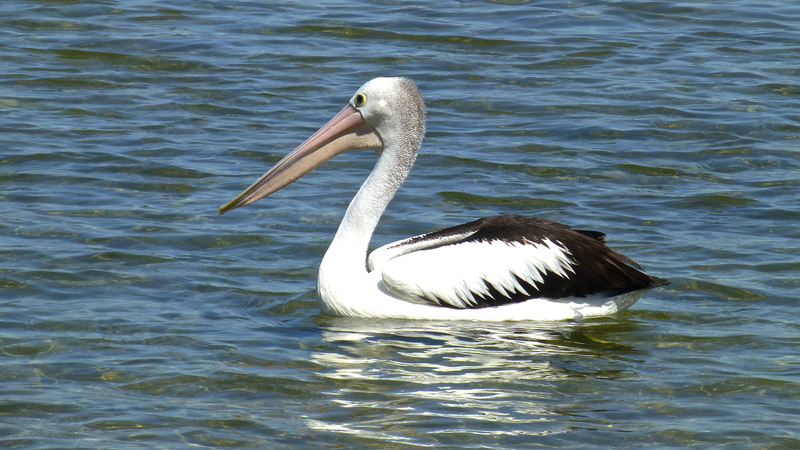 We are so used to seeing pelicans in Australia that we often pass them by without stopping for a good look. Common though this bird may be, there are some things we might not all know about this bird. Here are some points of interest that you can use in a Trivia quiz! 1. There are seven species of pelicans in the world, all of them black and white except for the brown Pelecanus occidentals. That’s a pelican we have seen in the Galapagos Islands. 2. 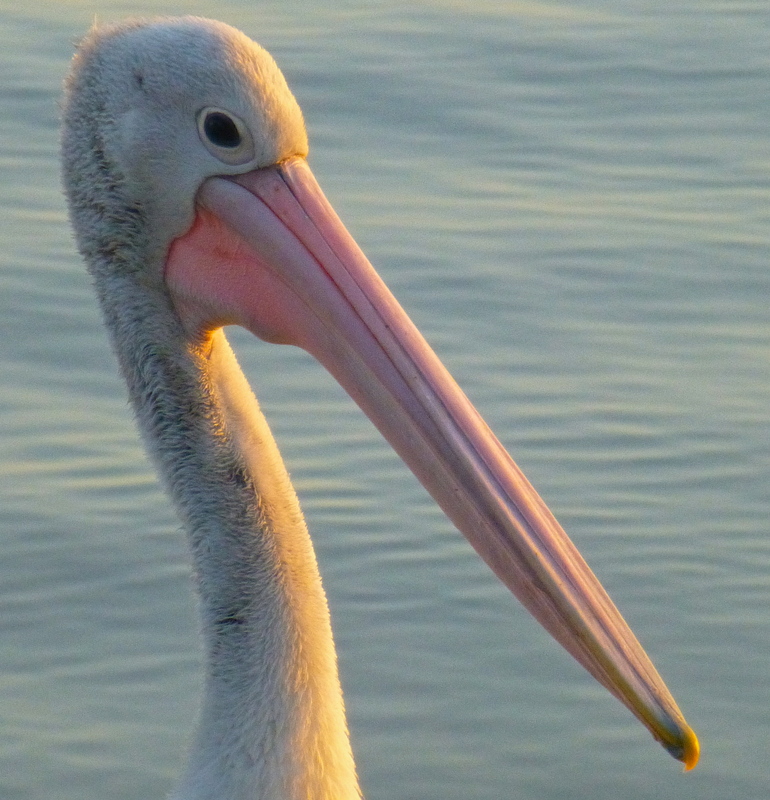 Pelicans have a wingspan of 2.3 m – 2.5 m. They need those big wings to help lift themselves off the water. 3. And even when they do get airborne, Pelicans can’t sustain flapping flight. But they are excellent soarers, using the thermals to remain in the air for 24 hours at a time, covering hundreds of kilometres in search of food and water in dry seasons. 4. A Pelican’s skeleton weighs only 10% of its total body weight. Of course pelicans are much heavier with a belly full of fish and, after eating, they just cruise around or rest on a safe rocky ledge like a break water. I expect this pair are ‘locals’ and don’t go far from ‘home’ at Iluka Bay where there’s plenty for them to eat. 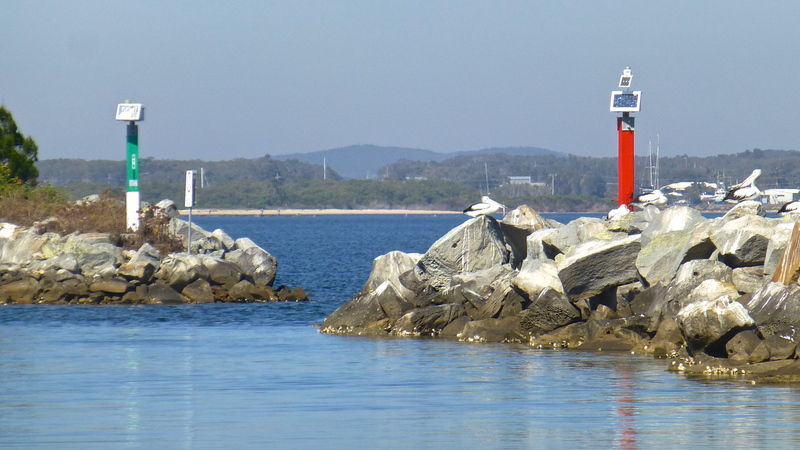 They no doubt wait for the next fisherman to come back through the breakwater with hopefully a load of fish – and fish heads that are not wanted! And at the end of this bay is the harbour for the professional fishermen. It’s a very good place for a pelican to live. 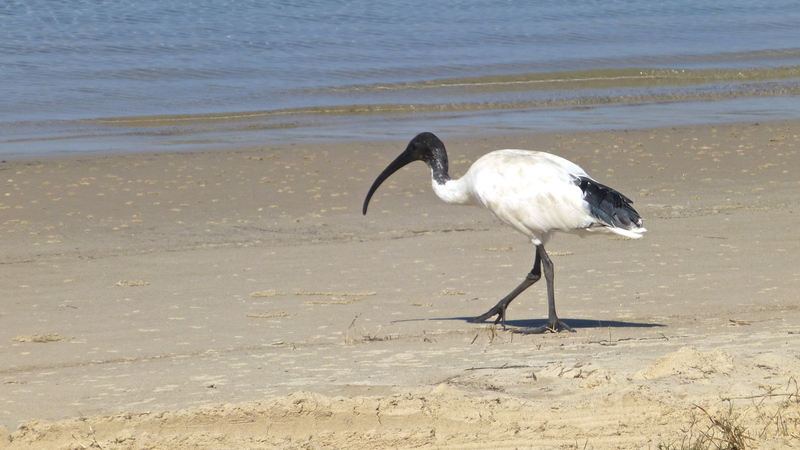 Further along the beach, an Australian White Ibis was searching for food. This bird comes with a real tongue twister of a name; Threskiornis moluccus. Using their long curved bills, they dig up food from the mud. They eat invertebrates. Best of all they seem to really enjoy mussels which they open by whacking the hard shells on a rock. I had hoped there was a path along the breakwater but it’s just a jumble of very large rocks protecting the bay from the river currents and strong tides. 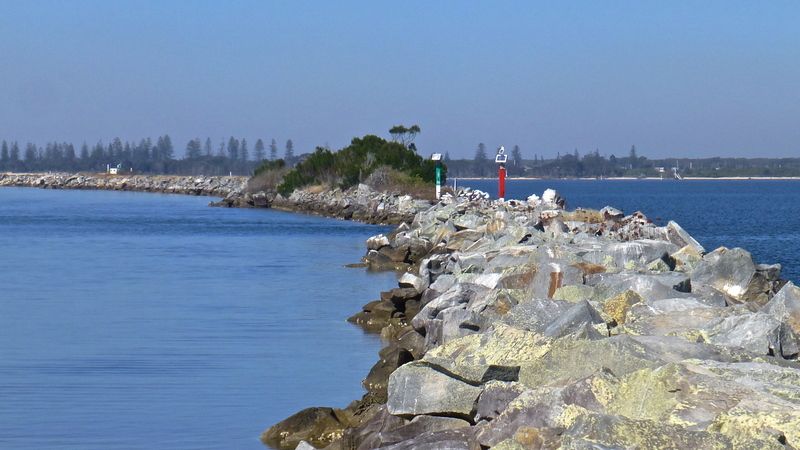 This breakwater is essential to Iluka because the Clarence River is also known for very large floods. In a park beside the bay, is a rather smart looking shed for the rowing club and other aquatic sports. The mural is very much in keeping with the scenery. A Masked Lapwing, Vanellus miles novaehollandiae, kept an eye on me as it searched for insects. Since it lives, nests and feeds on the ground, it is always wary. 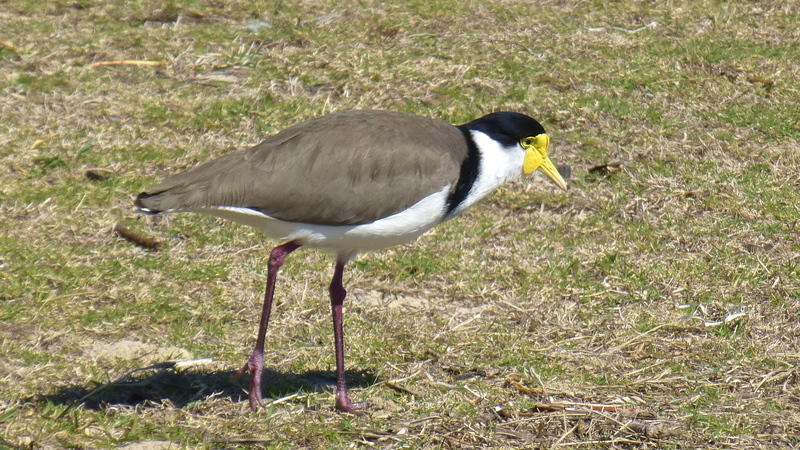 This fairly common Australian bird is also known as a Masked Plover, a Spur-winged Plover or just Plover. The distinctive black neck stripe on this bird distinguishes it as an eastern state variety. The northern variety has an all white neck and larger wattles. 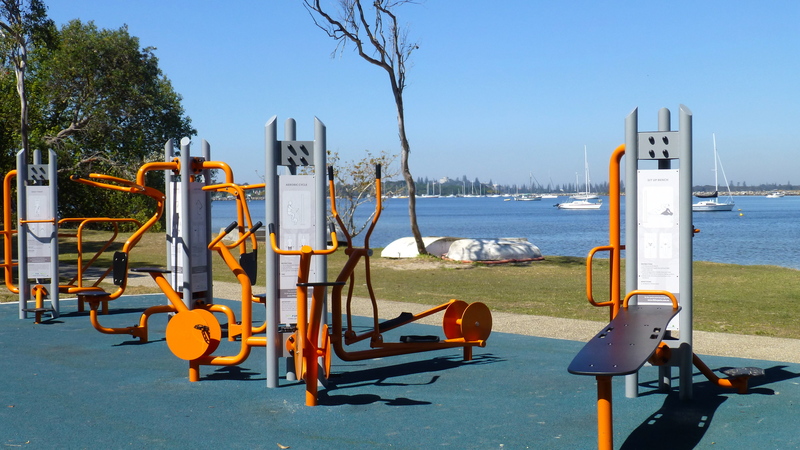 A new addition to the foreshore here is a very good and solidly built workout station. I tried it out with a lady who had ridden her bike down to do her morning exercises. It was a very pleasant way to do exercise while looking out at the bay, the boats and the birds. Walking back towards the other end of the bay and the professional fishing harbour, I enjoyed some shade in the heat of the day. The path is in excellent condition and used by walkers and bike riders. There’s one thing that is very certain about this village; people are encouraged to get out and about and enjoy the delightful environment. And they do. 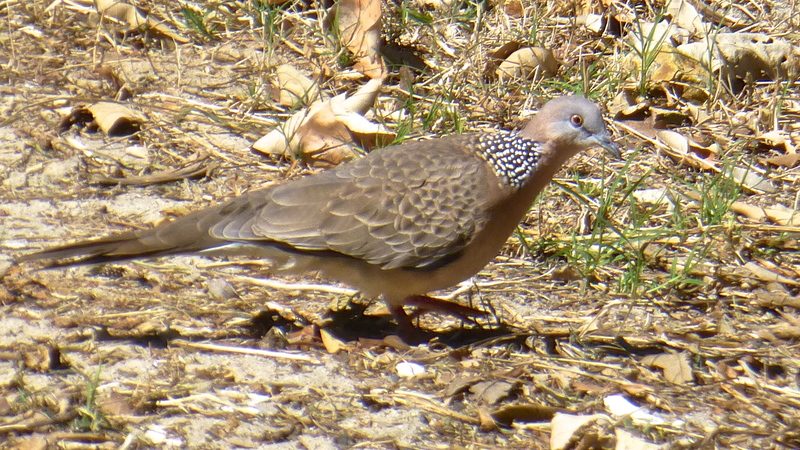 Even this pretty pigeon was out for a walk and followed along with me for quite a while. 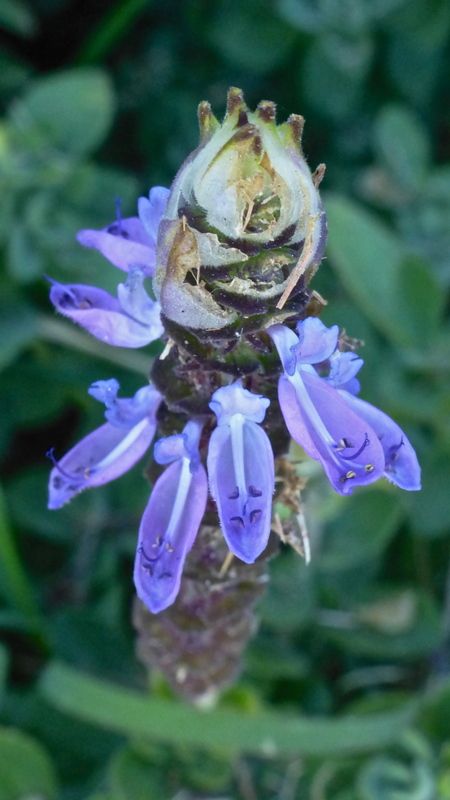 Among the usual seaside flowers was this unusual one that I had never seen before. 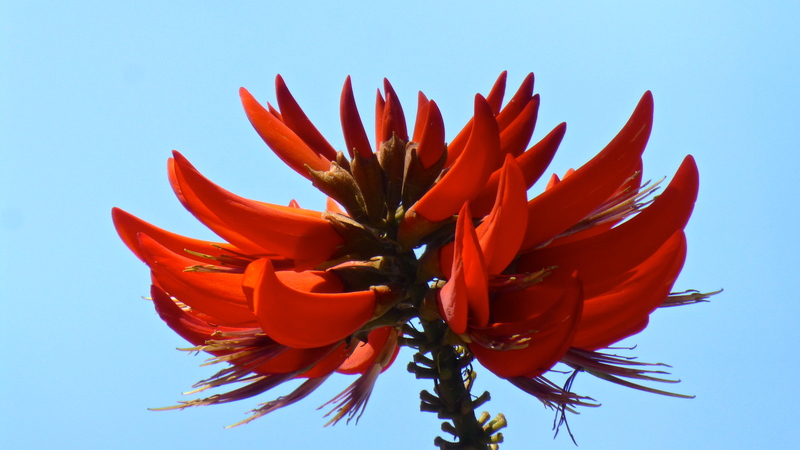 But this magnificent flower of the coral tree, one of the Erythrina family of plants, is well known to me. It reminds me of our wonderful, kind neighbour, “Gran”, who lived next door to us when I was a child. Between our house and hers was a row of coral trees and seeing these splendid red flowers always brings me a special sense of joy as I remember her with love. Our own Grans lived far away. She was our special Gran. 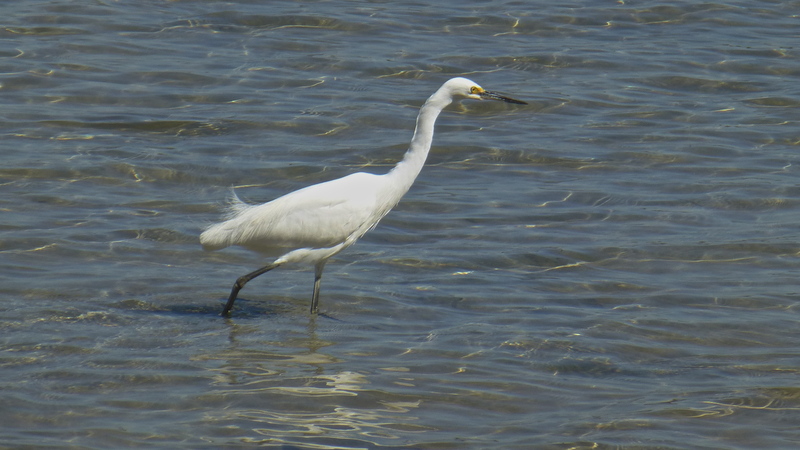 A white heron flew down to try its luck in the waters beside me. I love to watch them stalking their prey. As usual in most Australian water ways, a couple of ducks came by to see if I had some food for them. No such luck. There’s plenty of natural food for the birds here. 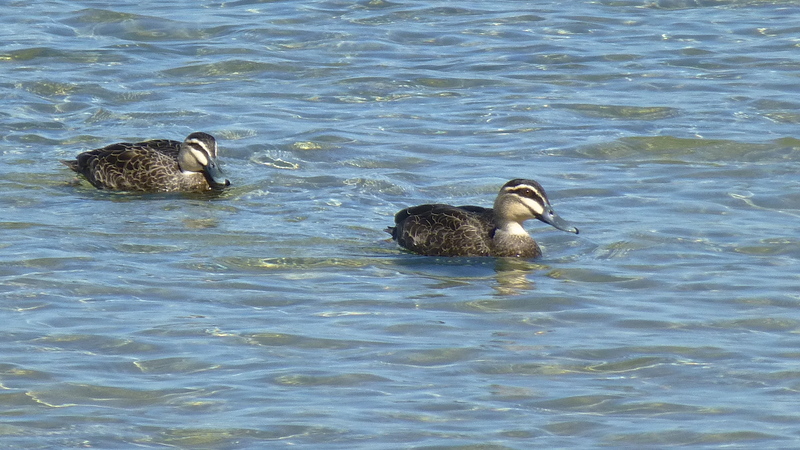 These ducks are Pacific Black Ducks, Anas superciliosa, a very common duck. It frequents all types of waterways and feeds mostly on seeds, especially of aquatic plants. However, they also like to eat small crustaceans, molluscs and aquatic insects. 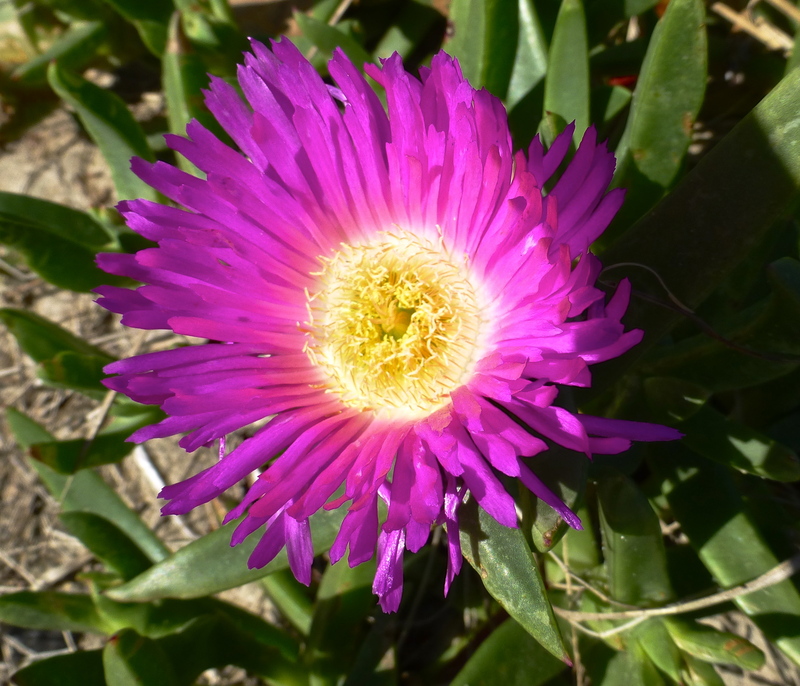 On just about every coastal walk in Northern NSW you will come across the glowing pink flower of the Mesembryanthemum, a native of South Africa. And since this flower’s name means ‘midday flowering’, you’ll see them at their very best in the heat of the day. There are several paths back up from the river to the village. This one was a little steep. 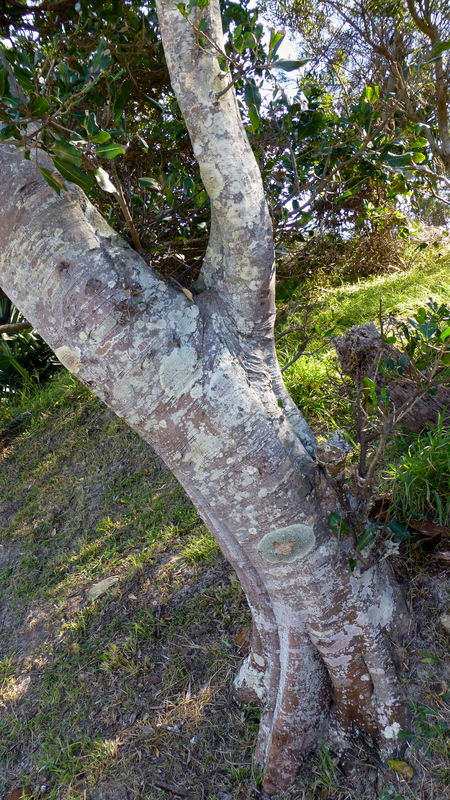 A tree on the side of the path seemed to grow out rather than up, its trunk an art gallery of lichen. 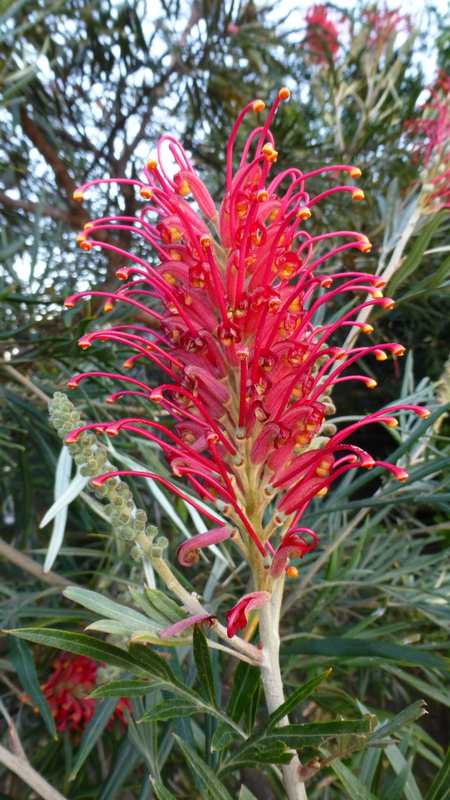 Grevillea is one of my favourite native Australian flowers and this one was a real winner. These were growing in someone’s front yard. 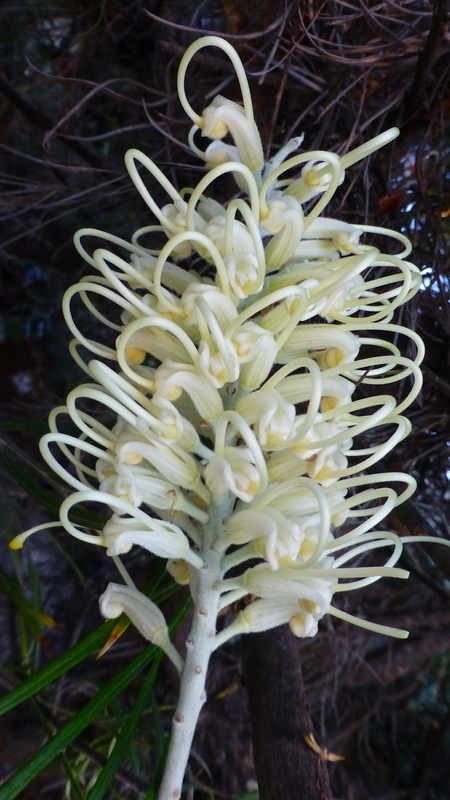 Beside it, this beautiful creamy Grevillea was just beginning to uncurl. 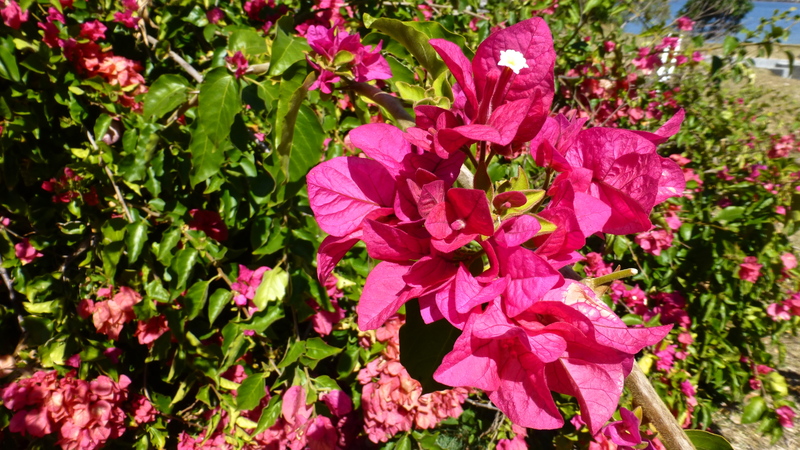 A standard garden plant in any northern NSW coastal garden is the bougainvillaea. They provide wonderful splashes of colour – mainly reds and pinks. After a delightful morning walking by the water, I returned ‘home’ to the Iluka Motel for lunch, a rest and a quiet read on my private back patio. This is a great country motel and I can’t thank Margaret and Les enough for the warmth of their hospitality. I’ll be back!